In this Short Tutorial, I will show you how to prepare your (first) Rom Hack, and show some useful Programs for editing your Rom, that you probably need later. I will try to keep this Tutorial Simple as possible, and if you got any problems, just reply down below! Step 1: Getting Everything that is needed (For #1). If you like to, you can get a Starter Pack for almost most of the stuff you need for the beginning. Step 2: Getting the ROM Prepared. This isn't much harder to get your Rom successfully prepared. It takes just a few Clicks. > Extend the Rom by simply clicking OK on the next pop-up window. This is the last step of preparing the Rom. It will also be easy, so don't worry about the stuff getting "hard". The next thing (which is very Important) was applying the tweaks. 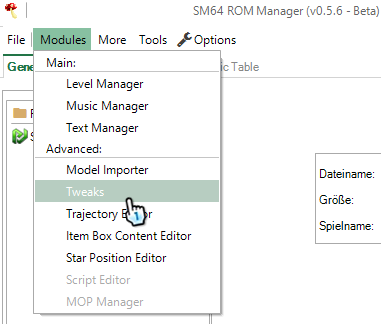 To do it, head over the "Modules" drop-menu and select "Tweaks". Then don't forget to save the Rom! After this step you can start the Rom with the included Emulator. Also the Emulator is already pre-configurated, you only need to configurate your controller. After everything is done, you can start your Rom Hack! And Well, there you go, you prepared your Rom! If you have any issues or if I missed anything, you can simply reply and I will respond soon. Current time: 04-25-2019, 06:18 PM Powered By MyBB, © 2002-2019 MyBB Group. By using our website, you agree to our Terms of Service.